Many adults need to interpret workplace data as part of their employment. Their capacity to do so depends on their statistical literacy levels and their attitudes to statistics. To identify and develop the statistical literacy of adults with limited understanding it is important to know what approaches to professional learning might be effective. 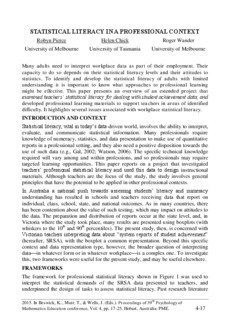 This paper presents an overview of an extended project that examined teachers‘ statistical literacy for dealing with student achievement data, and developed professional learning materials to support teachers in areas of identified difficulty. It highlights several issues associated with workplace statistical literacy.